The unfathomable nature of heartfelt love and devotion seems only to arise through grace; this irresistible attraction is inherent as a wonderfully impersonal quality of that grace. For Sri Alan Neachell, an artist from the U.K., that attraction was what brought him to Sivananda Ashram in the year 2000. 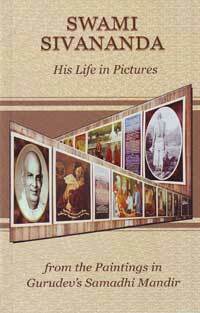 That grace inspired Alanji to dedicate himself to a three-year project to present the life of Gurudev in words and pictures to be displayed in his Samadhi Mandir. Numerous devotees have been very inspired by these beautiful paintings and lofty words, and many requests have come for the paintings to be reproduced in printed form. This small booklet is a response to this heartfelt desire. It is offered with the loving wish that it be a constant reminder of Swami Sivananda's extraordinary life and an encouragement to devotees from around the world to follow in Gurudev's footsteps.